Yesterday 12 December 2013 was the Feast Day of Our Lady of Guadalupe which is celebrated by the Catholic Church. As some of you who follow this blog are not Catholic I thought that this was a miracle that transcends all Christian faiths. 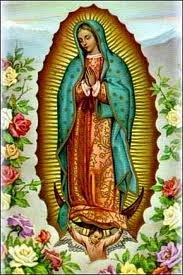 Indeed the miracle covers all humanity and is as important for this fact, since the Virgin Of Guadalupe first appeared to a pagan who had little or no knowledge of the Catholic Church. The Mother of God appeared to and for all of us. Even if you are not a Christian (and I hope you are) then this extraordinary event, which can still be seen today 500 years later, can not be explained by modern science. Indeed the miracle continues every day since it first happened as the "Tilma" is like a living apparition. Here are two links. The first one describes the miracle and the second is a scientific probe into the event. This man is a scientist who at first tried to disprove the miracle. Well, I found that to be very interesting. I plan to look into it some more as the fact that the Tilma hasn't disintegrated in all these years is really quite fascinating. If you check into the link every now and then (usually in the spring in USA) you will sometimes find where the Tilma is making a tour of the USA. I do not think it is the original but it is a good PHOTO of the original as there are many details that are not given justice online. It is a bonified miracle the Tilma as many have tried to prove it a fake and failed, and in the process found their faith.